SinMix reserves the right for changing the Terms & Conditions one-sidedly. Please refer to this site periodically for any changes that might have occurred. SinMix offers professionally recorded amplifier and cabinet profiles for use with the Kemper Profiling Amplifier. 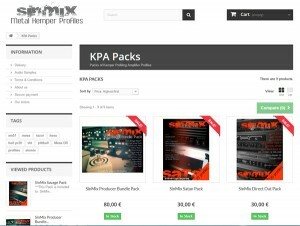 You can make a purchase for individual profile packs and bundles as well. You are paying for the rights of using these profiles for yourself only, you are strictly forbidden from sharing them or making them available online for free or for resale. Customers are responsible for entering the correct details before making the payment. Please double check for spelling errors and mistyping. We never release or sell personal, private information. Customers are required to pay for their chosen services at the time of placing their order. For your payment you recieve a confirmation by e-mail which contains the instructions for obtaining the purchased items. As a vendor verified by PayPal, we accept instant payment through PayPal.